We are not VAT registered. For this reason we cannot charge VAT. 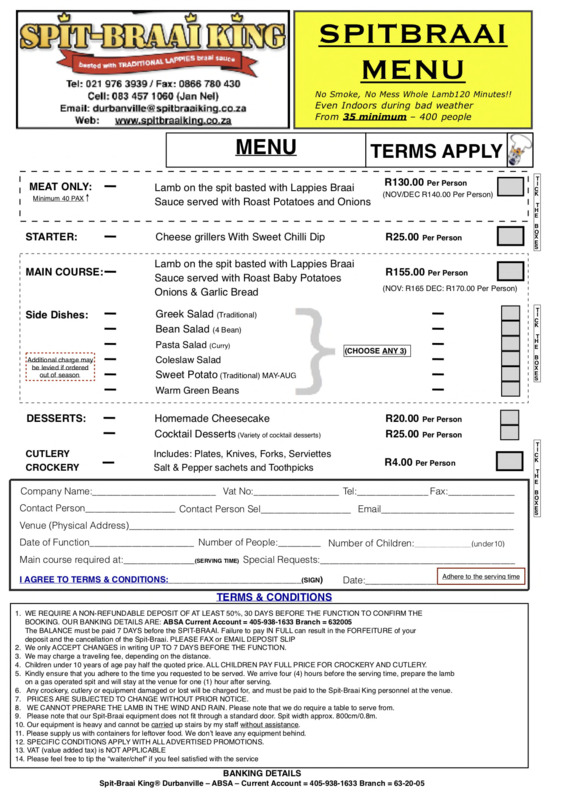 Click the menu above to download the PDF version. Please complete and send back for quotation or booking. Please choose between our Meat Only and Main Course options to continue. Place a request for a booking. Select your Main Course options below. Cheese grillers served with Sweet Chilli dip. Please select three (3) dishes from the options below. Your are welcome to choose additional dishes if you like to. A Something Sweet to end it all. Cheesecake: Made in our kitchen, lovely and perfect for summer. Cocktail Desserts: A variety of cocktail desserts. A platter from sweets heaven. Koetsisters, Lemmingtons, Caramel Cones, Jam tarts ect. Contact details of the contact person for the function. Please supply us with the venue of the function. A physical address will be perfect. If there is anything we can do or you require please let us know. Vegetarians we can make a plan, we have some great vegetarian meals. Anything, we are here to help! 1.We cater for a minimum of 35 people and a minimum of 40 people for our Meat Only menu! 2. WE REQUIRE A NON-REFUNDABLE DEPOSIT OF AT LEAST 50%, 30 DAYS BEFORE THE FUNCTION TO CONFIRM THE BOOKING. 3. WE ONLY ACCEPT CHANGES IN WRITING UP TO 7 DAYS BEFORE THE FUNCTION. 4. The BALANCE must be paid 7 DAYS before the SPIT-BRAAI. 5. Failure to pay IN FULL can result in the FORFEITURE of your deposit and the cancellation of the Spit-Braai. 6. Quote invoice number as reference for payment. 7. Please fax or email deposit slip to the relevant branch used. All contact information is available on our website. 8. A travel levy will be charged and added to your quotation/invoice. 10. CHILDREN PAY FULL PRICE FOR CROCKERY AND CUTLERY. 11. Children pay full price on specials and certain menu options. 12. PLEASE NOTE VALUE ADDED TAX (14%) IS CHARGED! 13. PLEASE ADHERE to the TIME you requested to be SERVED. We arrive (+-4) four hours before the serving time, prepare the meat on a gas operated spit machine and stay at the venue for one (1) hour after serving. After which we collect and check all our equipment on site. 14. Any crockery, cutlery or equipment damaged or lost will be charged for, and must be paid to the personnel at the venue. Invoice to follow. No equipment will be left behind! 15. Vegetarians welcome: Please let us know of any dietary requirements. We are more than happy to help. 16. PRICES ARE SUBJECT TO CHANGE WITHOUT NOTICE. 17. WE CANNOT PREPARE THE MEAL IN THE RAIN & WIND. We require a suitable area for preparation. 18. Please note that we require a neat clean table/s with table cloths for serving. 19. Please note that our Spit-Braai equipment does not fit through a standard door. The machines are 90cm wide. Our equipment is heavy and cannot be carried without assistance. 21. Please ensure that there are containers for leftover food. We do not leave any equipment behind. 22. SPECIFIC CONDITIONS APPLY WITH ALL ADVERTISED PROMOTIONS. 24. Spit-Braai King CC / Lappies Braai Sauce CC / Pork Roast Professionals CC / Spit-Roast King are registered trademarks. All public documents and images are copyright protected. 26. Spit-Braai King takes no responsibility for any harm/damage caused beyond our control. 27. Serving date & times are given in good faith. We use every endeavour to comply therewith. 28. We cannot be held responsible for external influences e.g. traffic, accidents, road closures etc. 29. We cannot take responsibility for any delay of goods from suppliers. 30. Certain Terms and Conditions may differ depending on the branch used. 1. We cater for a minimum of 35 people for the braai, minimum of 35 people for the steak menu and a minimum of 40 people for the traditional braai menu. Our Chicken and Beef Special from 35 people and upwards. 2. Children pay full price. 3. Additional charge will be levied on braai menu if suitable facilities are not available on site. 4. Braai and Steak options are dependent on the weather and suitable facilities. 5. Stew Menu: Stews are prepared fresh in our kitchen and served at the venue. We arrive shortly before serving. 6. Our steak option is prepared on a gas grill on site. Please make sure facilities are suitable for grilling. 7. Customers should adhere to steak and braai menu’s serving times! NB! Please. 8. Not all branches partake in the advertised specials! 9. PRIVATE functions. Eg. Birthdays, 21st’s Party’s, House warming’s, Farewell’s etc. may use Spit-Roast King. www.spitroastking.co.za . COMPANIES however will need to use Spit-Braai King. Spit-Roast King is not VAT registered. Please Agree to the terms and conditions to continue.